“How do you trim goat hooves?” I looked over at my husband who is a farrier. He trims horse hooves on a somewhat regular basis…but when I asked him this question, he just shrugged his shoulders. Well, that wasn’t helpful! So, we blundered through our first goat hoof trimming. That was ten years ago. 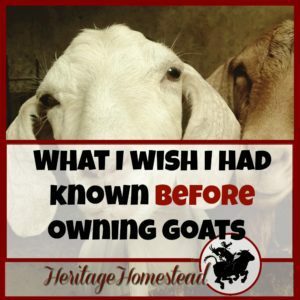 And I still don’t like trimming goat hooves! But I’m much better at it! You know the process of trimming those hooves needs to begin. But where DO you begin? How do you get the hooves trimmed correctly? One thing you know for sure though…you really don’t want to see any blood! 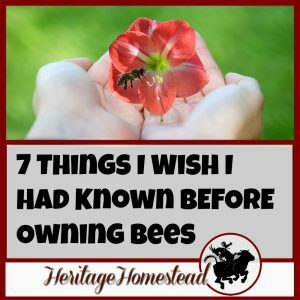 Tips to make this chore the most successful! Where to record your trimming information for each goat. Trimming goat hooves may be the dreaded task of goat ownership, but it is a necessary and important one. 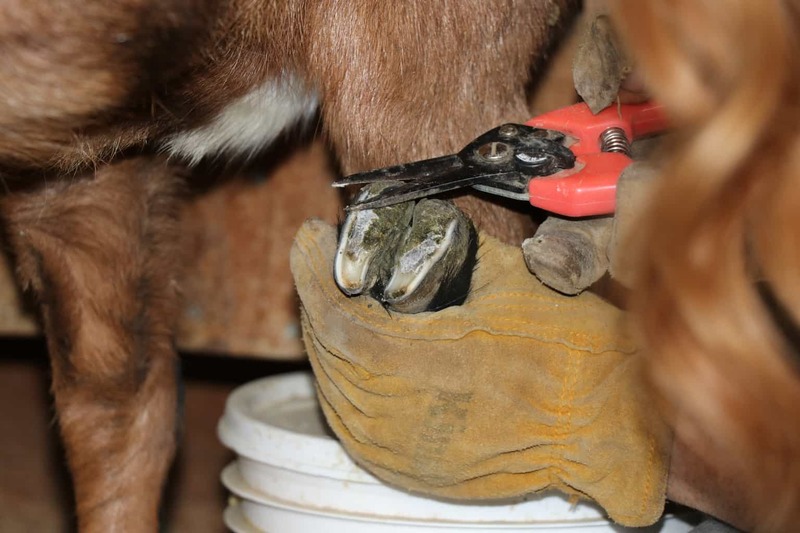 A goat with overgrown hooves has the potential to become very sick and possibly die. Why? Well, their feet are their means of transportation. If they are uncomfortable and hurting, they will travel less, and when they travel less, they are eating less and not getting the nutrient intake that they need. When this happens, they are setting themselves up to become very sick. 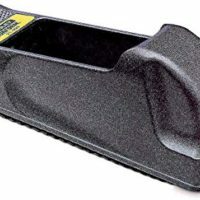 Imagine if you were to have toenails that were really long and then to smash them into shoes that were very small for your feet or to just wear a pair of shoes all day that were decidedly too small. Before long you would be limping and crying out in pain and not moving around much. It is no different for a goat. 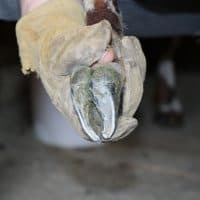 And when the hoof wall begins to fold under the hoof, it traps poop, dirt, and bacteria and hoof rot and hoof scald begins to happen in the hoof wall. For a goat, if they haven’t got their (hoof) health, they haven’t got anything. Gloves Take my word on this: you won't regret wearing gloves. Goats wiggle, and a quick jerk of their leg will put a nice hole in your finger if you aren't careful. 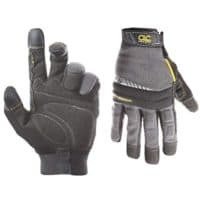 Wear protection on your hands. 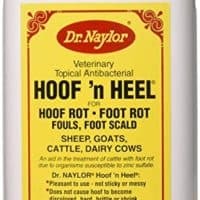 Read more about Goat Hoof Care here. 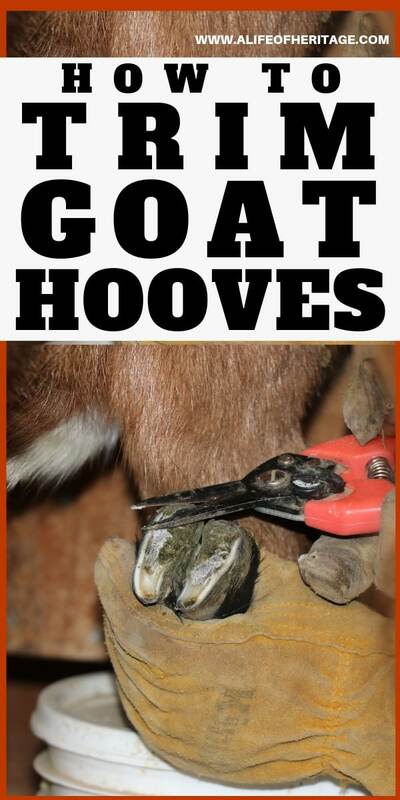 **Goat hooves need to be trimmed on a regular basis. If not, their hooves will grow under and will trap poop and dirt and can cause their hooves to grow in unnatural ways. It's important to keep them trimmed. Not only is it healthier for the goat, but it is also much, much easier for you to trim regularly! Trim at least quarterly but a goat's hooves may need to be trimmed as much as once a month, so keep an eye on those feet! If you have a busy life with a lot to remember, you need to write down and keep track of when you last trimmed your goat's hooves. And that is easy in this bundle: The Goat Health, Information and Profit Bundle. Below is my doe Eva. As you can see, her hoof wall has grown long and under her hoof. That will need to be pulled up and trimmed off! Ok! Now it’s time to get down to business! If you are set to trim those hooves, this is the best way to go about it. Just remember, you want to avoid blood! You don’t want to open up any wounds in the hooves, especially since they are in contact with the dirty, poopy ground at all times. 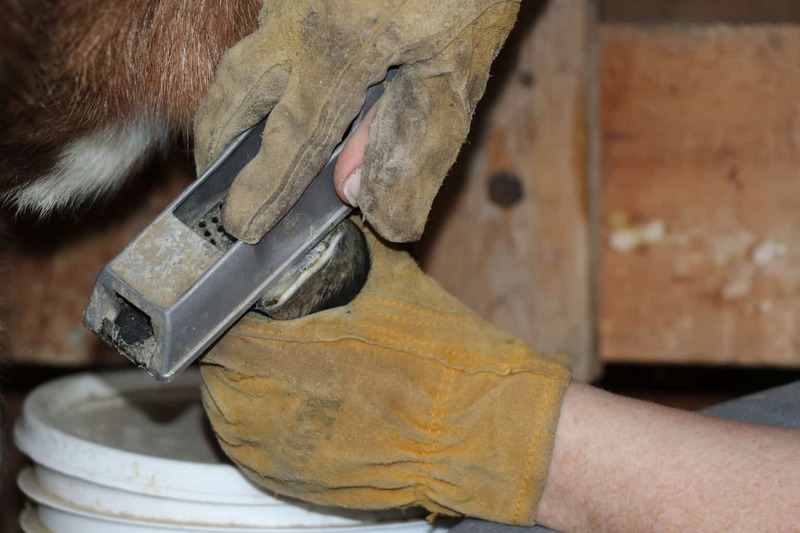 Follow these steps and you will be well on your way to a well-trimmed hoof! PREPARE TOOLS. You will want all of your tools in place and close by. You don’t want to be scrambling. PLACE GOAT. 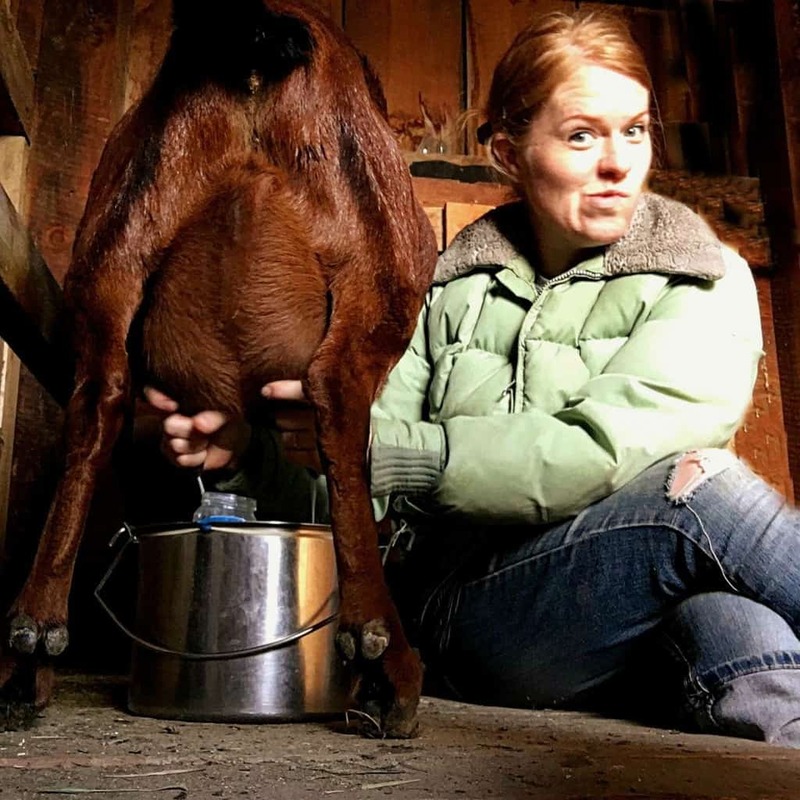 Get your goat in place, whether it is on the milking stand or elsewhere. And give a treat! It will help them be (more) happy for a bit of time while this is taking place. LET GOAT KICK IT OUT. Your goat will not be happy to stand on three legs. And will probably do a bit of kicking and pulling. Let the initial kick get out of their system before you begin. CLEAN. 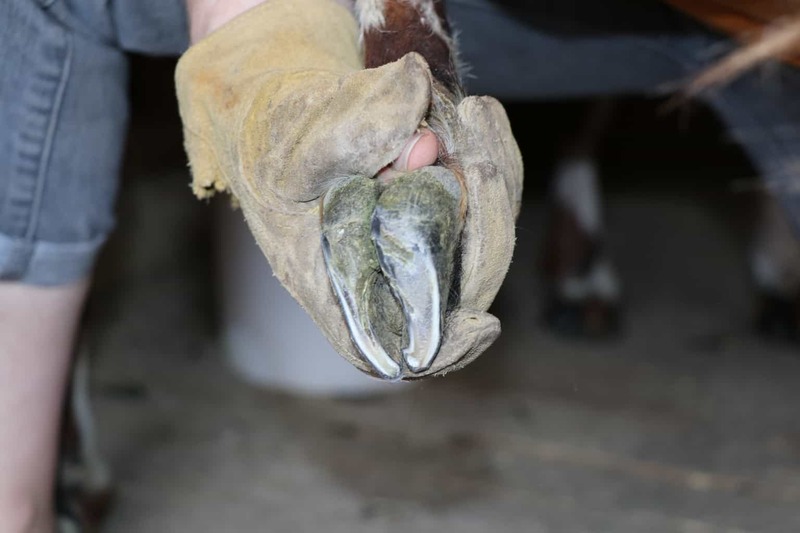 Clean out the hooves, the toe and between the toes, using the tip of the clippers or the hoof pick with the brush. The picture below shows the trimmers being used to clean out the debris in the hoof. *Depending on how long the hoof wall is, you may need to trim the overgrown part off first and then clean. HOOF WALL. If the hoof wall is overgrown and/or growing under the hoof, pry it up and open and then begin to carefully cut off the excess. As you do this don’t cut too deep until you can see what it is going on with the hoof after the excess is cut off. Below I’m trimming the outer hoof wall off. TRIM CAREFULLY. Keep trimming the toe until you can see pink. At this point, you will be trimming very small pieces at a time. Go slow and steady. 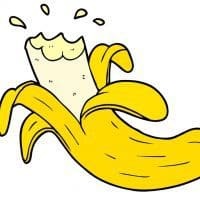 As you trim, remember that you want the coronary band to be parallel to the ground. TRIM BETWEEN TOES. After you’ve trimmed the outer wall, now begin to work on the inner hoof wall between the toes. Trim the excess. The heels are the softest part of the hoof! Below I’m trimming between the toes on the inside. TRIM HEEL. The heals, the very soft, plushy part of the foot, can be trimmed. Remember, your goal is to have a flat hoof. TRIM OFF ALL HOOF ROT. You don’t want to leave any parts of hoof rot on the hoof. Usually, hoof rot is found in the hoof wall on the toe of the hoof. FLATTEN SOLES. The goat should walk on flat soles. 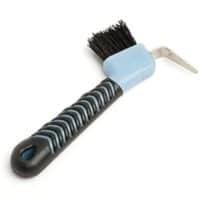 You can use a hoof rasp like the one below to help flatten the bottom of the hoof. STEP BACK AND CHECK HOOF. You want to put the hoof down and step back to look at the progress. You want the coronary band to be parallel to the ground. So keep checking that as you go! The drawing below shows how the coronary band (where the hairline meets the hoof) and the bottom of the hoof should be parallel to each other and the ground. 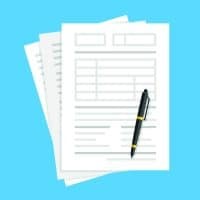 Record each trimming for all of your goats in their personal record sheets in this Goat Health and Information Binder. 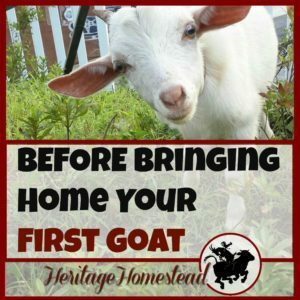 Because you are organized, prompt, and on top of your goat’s health with this tool. SLIGHT BLOOD. 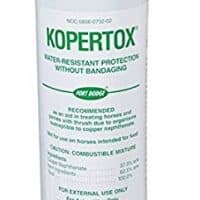 Apply a liquid bandage, like Kopertox, to the entire bottom of the hoof. After you apply it, it takes about 90 seconds to dry. If the ground is dry and there are normal weather conditions, this bandage will last about 24 hours. Reapply if needed. PULSING BLOOD. You should have something like Blood Stop Powder on hand. 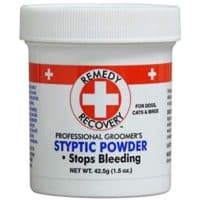 If serious blood flow begins, apply the Blood Stop Powder immediately. Once the bleeding stops, then use the Kopertox. 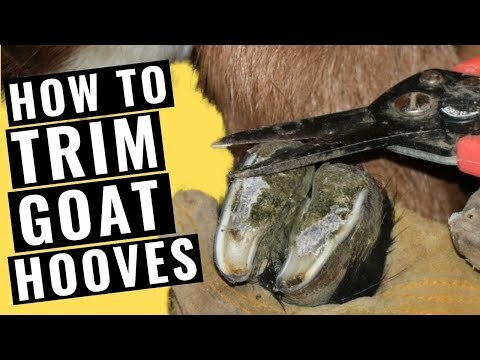 Trimming goat hooves can end up feeling like a chore…like one of those chores that you just struggle to get done…so it’s important to find the best way for you to do it! Your goats will probably not like to stand on three legs, so they may stomp their feet and try to kick their legs out of your hand. That can be frustrating and tire your arms out. And bending over 4 legs (x’s how many goats you have), can make any back a bit sore by the end of the day. Get set up as best as you can, preferably where the goats are standing on a hard surface and are at the level of your arms so you don’t have to bend over much. These are some options on where you can trim your goat’s hooves to make it easiest on all involved. Squeeze Chute. This will work even better if it is raised off the ground to be about as high as the worker’s arms. Milk stand. This is probably the most commonly used option. If you can set up a stand where the goat’s feet are at the level of your arms, that will save you from backbreaking work. Tie to a fence. Depending on the goat this may work, especially if you don’t have any other options. Place the goat on its side. Sometimes this is the only option for an unruly goat. Most likely two people will be needed: one to hold and one to trim. This will probably also be the hardest option. 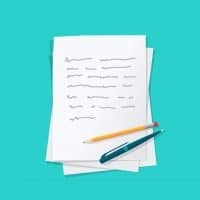 These tips are ones to take heed of and think about before you begin. They will hopefully help the whole process go much smoother. Trim after a rain or when it’s been wet. This will soften the hoof wall and make it easier to trim. If you have quite a few goats to trim and also plan to give supplements or shots, do it all in one day to prevent multiple handlings. Mark each goat with a paint stick after their session has been completed so you know that they have been done. Mark their forehead so that it is easy to spot which ones still need to be finished. Prepare beforehand. Have all of your tools and anything else you plan to do with the goats on-hand, ready, and easy to reach. Remember, if you or the goat gets frustrated, you can always start again another day. If you get most of it, but realize that there is a bit more to work on, but your hands are cramping and your goat is crabby. Finish it the next day! All is fair in goats and hoof trimming. A hand-held grinder may be needed for really overgrown hooves. Look at a very young kid’s hoof to see what they should look like. Take a picture and save it to a folder on your phone so you can easily get to it the next time you trim. 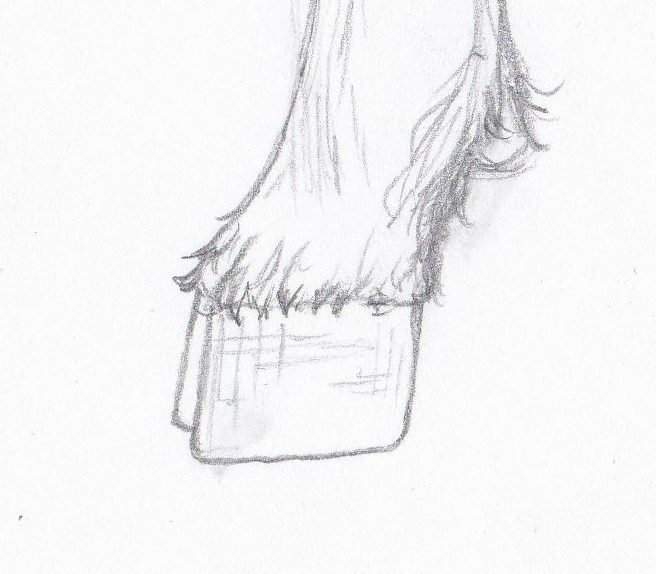 But this will give you a good idea of what their hooves should look like when you are done. TRIM REGULARLY. Trimming regularly will greatly minimize problems and make it much easier on you and the goat! 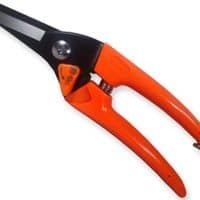 You can use pruning shears as an alternative to hoof trimmers. I did buy some but they weren’t the right kind and I ended up just getting the hoof trimmers and I’ve been quite happy with that decision. But you certainly can try pruning shears to see if they will work for you. Well, there you have it! The dreaded hoof trimming chore is broken down into manageable pieces. And remember, if you keep at it regularly, it becomes easier and easier. And don’t forget to write down when you trimmed your goats in your goat health and information binder. Ohhhhh minerals. Minerals are so important to goats. Without them, they will get sick, have pregnancy and breeding problems and so many more problems. Read this to learn what to do for you goats to keep them healthy. 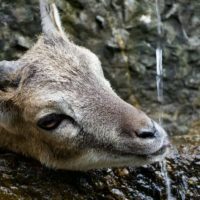 Did you know that your water source could affect your goats? It's very important to think about. Find out why here. Copper is an essential mineral for goats and you may need to supplement. 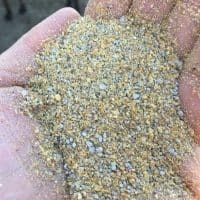 Find out what to look for and if you will need to add this to your goat program.